Garmin zumo 220 designed for bikers, features a bright 3.5-inch glove-friendly touchscreen colour display. The affordable, compact Garmin zumo 220 motorcycle navigator mounts neatly, right up on your bars ready to guide your ride with spoken street names sent wirelessly to your Bluetooth-enabled helmet or headset. With its rugged waterproof case that resists fuel sprays and UV rays, Garmin zumo 220 is built for life on the road. The Garmin zumo 220 also includes motorcycle mount hardware and an automotive mount, so the Garmin zumo 220 is ready to navigate right out of the box. Garmin zumo 220 has been discontinued. Accessories are available for your Garmin zumo 220. Likewise you can buy new maps. Explore the open road and enjoy a new perspective on navigation with the Garmin zumo 220 motorbike sat-nav. This rugged navigator is especially designed for two-wheeled adventures, whether on weekday rides across town, road trips or rallies. Navigate with detailed street maps for the UK and Ireland and smart route planning, aided by premium features like Lane Assist, spoken street names, 3D City View and stereo Bluetooth. This sleek and smart, yet rugged navigator pairs the best of Garmin’s popular nuvi in-car range with road-tested zumo features developed especially by bikers for bikers. Garmin zumo 220 has a bright, glove-friendly, colour touchscreen display that gives you all the information you need in an easy-to-read format. It’s easy on the eyes whether you’re riding in the bright midday sun or a moonless night. And the intuitive interface makes entering information as easy as shifting gears. But make no mistake this is no car navigator posing as a biker. It’s built tough. With its rugged waterproof case that resists fuel sprays and UV rays, Garmin zumo 220 is built for life on the road. Pick your route and hit the streets. The Garmin zumo 220 offers full mapping for Europe. The preloaded map data features up to 1.7 million points of interest, including hotels, petrol stations, cashpoints and attractions. In addition, Garmin zumo 220 offers lane assist to help guide you to the proper lane for complicated motorway junctions. The Garmin zumo 220 also comes standard with a digital fuel gauge so you can keep track of how many miles you have left before it’s time to get gas. And at the end of the ride, it slips comfortably into your jacket pocket. Searching for the perfect back road to share with your riding buddies? Or perhaps you’re planning a cross-country trip. With its powerful trip planning tools, Garmin zumo 220 can help you create custom routes via computer and then transfer your saved route directly to your Garmin zumo 220. Once home, you can review your rides in Google™ Earth. In addition, microSD™ card expansion makes it easy to share routes and add storage. Just because your bike’s parked doesn’t mean your day is done. The Garmin zumo 220 can also pull double duty as a navigator in your car or van when you’re on four wheels instead of two. In addition to the included motorcycle mount, Garmin zumo 220 also comes with a vehicle mount and power cable. The Garmin zumo 220, like all Garmin sat nav's, gets its speed camera data from the Cyclops speed camera database. The database provides advanced alerts to fixed, average speed, mobile, variable, temporary roadwork, red light and red light speed cameras. As you approach a camera, your device sounds an alert. Subscription charges apply. Click here to read more about the Cyclops speed trap database. Cardo Scala Rider headsets are available to pair with your Garmin zumo 220. The benefits of buying and using a Scala Rider headset with your Garmin zumo 220 are three-fold; 1. you can listen to sat nav voice turn-by-turn instructions, 2. listen to music and 3. communicate with other motorcyclists whilst riding (using the intercom when within range and mobile phone when out of range). ‣Turn-by-turn directions with spoken street names - "Turn right on Main Street"
Garmin zumo 220 is secured to your motorcycles handlebar using the supplied RAM mount and Garmin motorcycle mounting bracket. In addition the Garmin zumo 220 also comes complete with automotive suction mount and vehicle power cable, enabling you to install and use the Garmin zumo 220 in your car as well as your motorcycle. The Garmin zumo 220 features 4 different modes, these include: Motorcycle, Scooter, Automotive and Pedestrain. Garmin zumo 220 is preloaded with City Navigator NT for the UK and Ireland provided by here. here maps provide high quality detailed street level maps, which in addition to street information include features such as route calculation, Points of Interest (POI), Estimated Time of Arrival, and more. Further maps are available on SD card which insert directly into the Garmin zumo 220. Additional maps include North America, Australia and New Zealand, Middle East and Southeast Asia. The zumo 220 includes all the accessories you need to get you up and running, not only on your motorbike, but also in your car/van too. 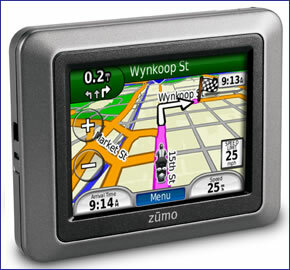 The zumo 220 is preloaded with street-level road maps for Western Europe. You can however, buy maps for all of Europe and Eastern Europe, or if you want to take your bike navigation device further afield, we may have the map that you need. Garmin zumo maps available include: USA, Canada and Mexico, Australia and New Zealand, Morocco and Southern Africa. Question: I have a Garmin zumo 220 motorcycle satnav. I need to replace the external power supply lead as it's stopped working. Checked fuse and tried the car car adapter and satnav is working ok. How much and what do I order. However, we do list an NMEA power/data cable (Garmin part number 010-11131-00) at our zumo 220 accessories page. Take a look at the 10th item down on that page. Garmin also list this cable as being compatible with the zumo 220. Obviously you wouldn’t need to use all of the bare wires (black/yellow/white/red/green) and (to avoid damaging your zumo) we’d recommend that you seek technical advice from an auto electrician regarding use of this cable. The red wire is rated at 8-36 VDC and is fused. Question: Is it possible to buy a new front case for a Zumo 220? Answer: Not from us, perhaps from Garmin? Do you have a question about the Garmin zumo 220? Submit your question via our contact page.